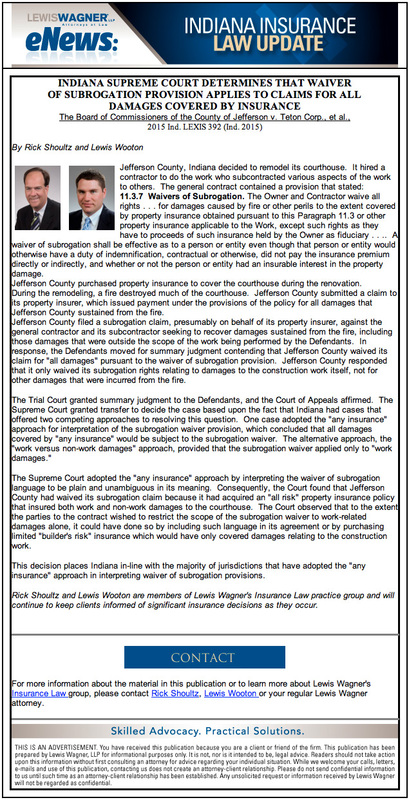 Many insurance claims require a prompt and objective review of coverage issues. 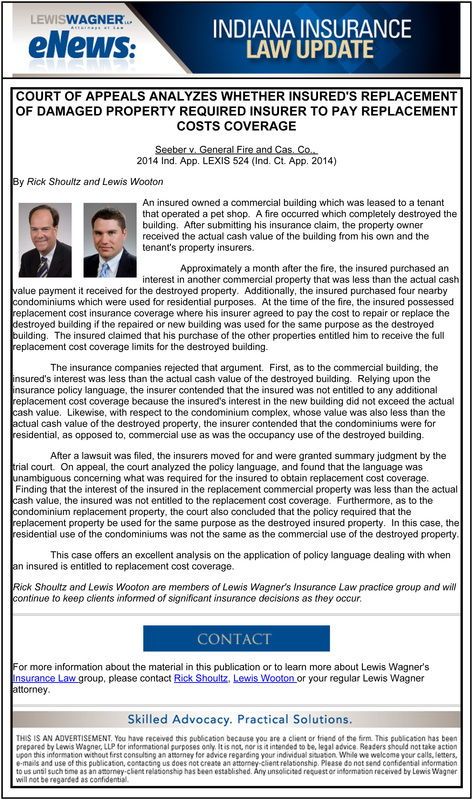 The critical factor in any coverage claim is the interpretation of the applicable policy. 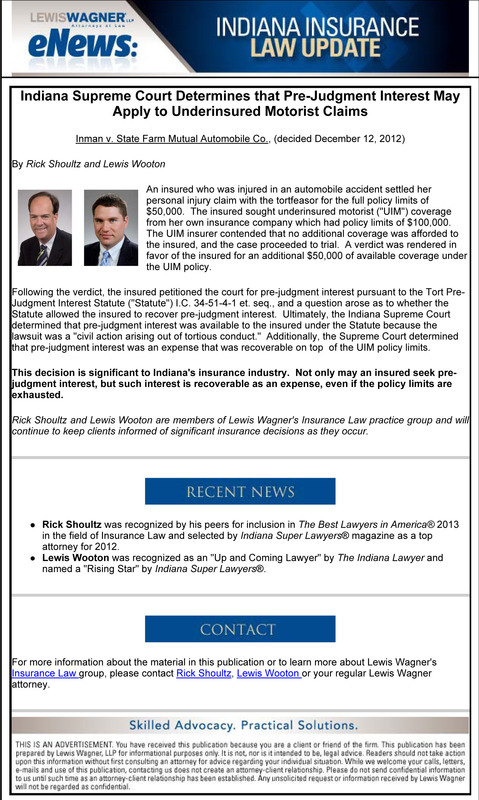 The insurance coverage attorneys at Lewis Wagner can assist you in interpreting that policy and analyzing the validity of first and third party insurance coverage issues. 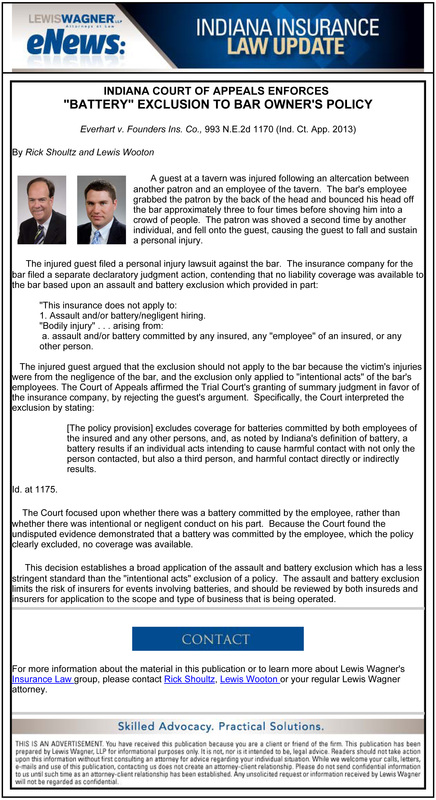 Our insurance coverage attorneys provide practical solutions to complex insurance disputes involving self-insured parties, businesses and insurance companies. 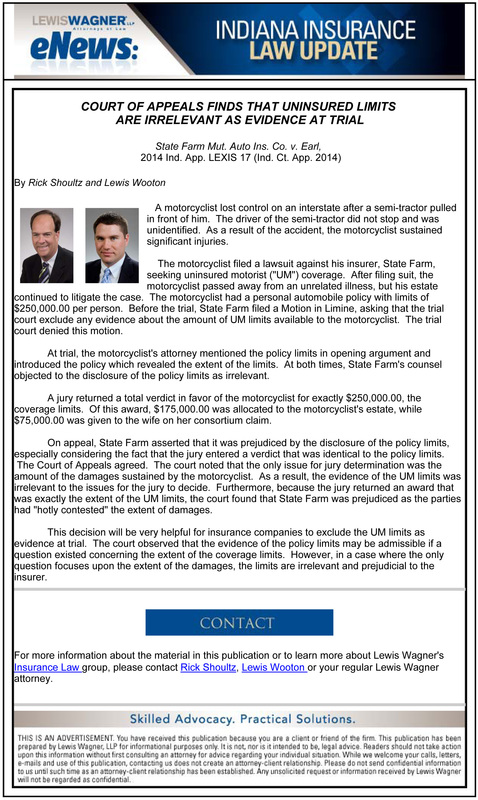 Our team of insurance coverage attorneys has advised individuals and businesses about insurance coverage issues including insurance policy coverage opinions, declaratory judgments on policy coverage and defense of insurers against breach of contract and bad faith claims. 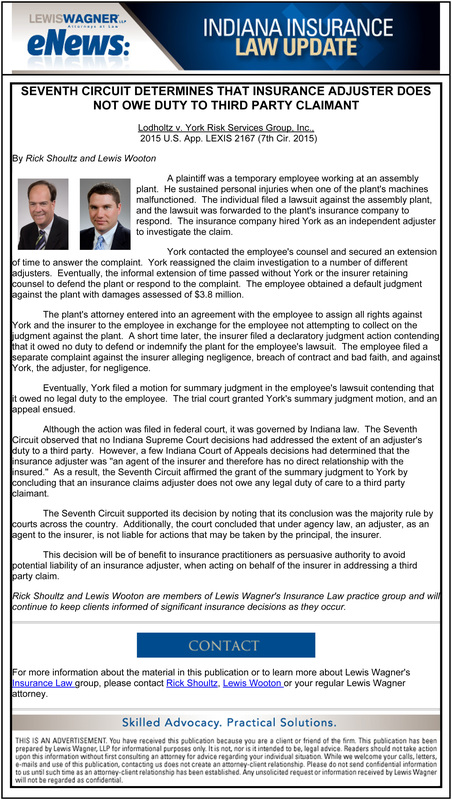 And The Defense Wins published by DRI: John C. Trimble and Robert M. Baker IV, recently obtained a verdict for the defense in Allen Superior Court in Fort Wayne, Indiana. 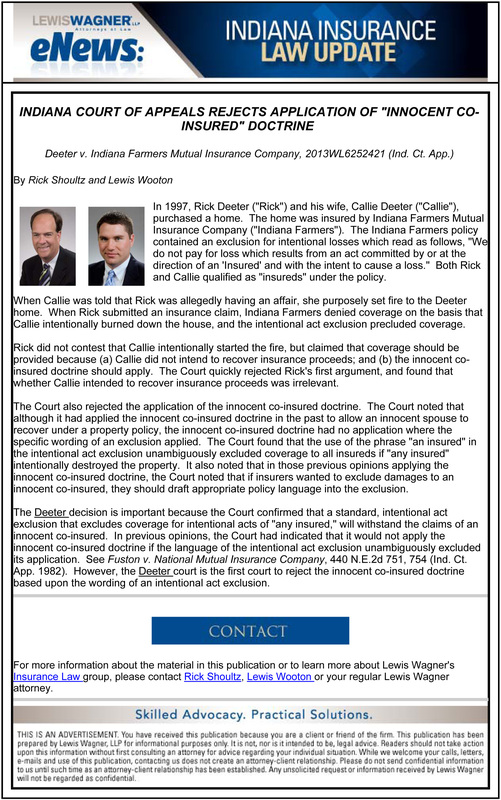 DRI And the Defense Wins: Marion County Superior Court Judge ruled that the Indiana State Fair Commission is not responsible for indemnifying or defending stage company. Walsh Constr. Co. v. Zurich Am. Ins. 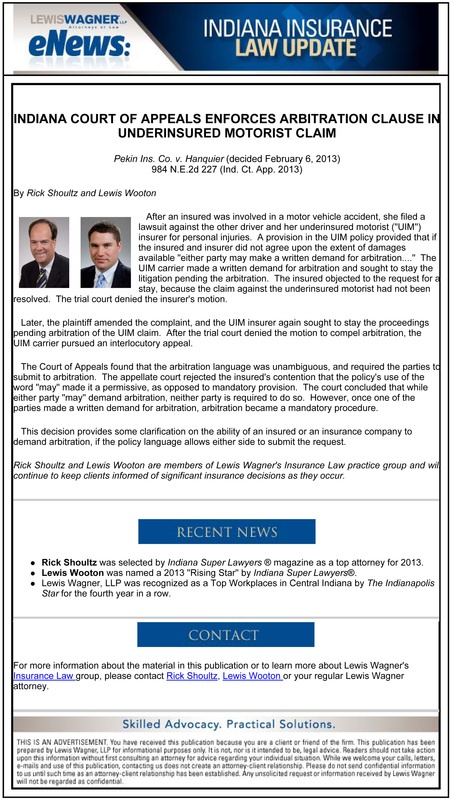 Co.
Milbank Ins. 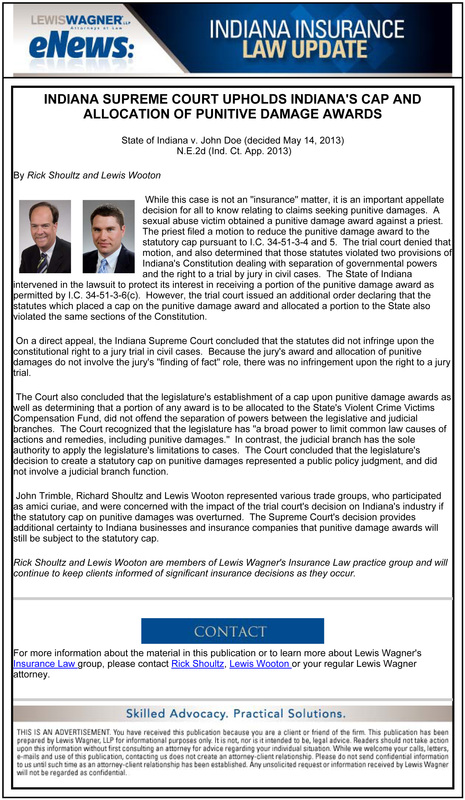 Co. v. Indiana Ins. 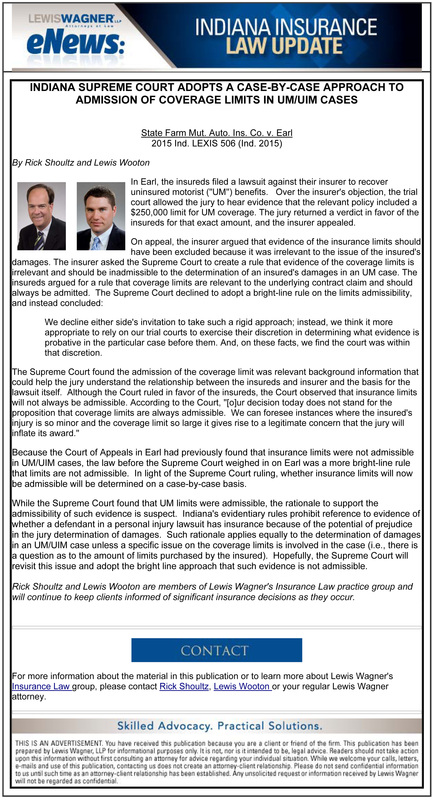 Co.
Garba v. West Bend Mut. Ins. 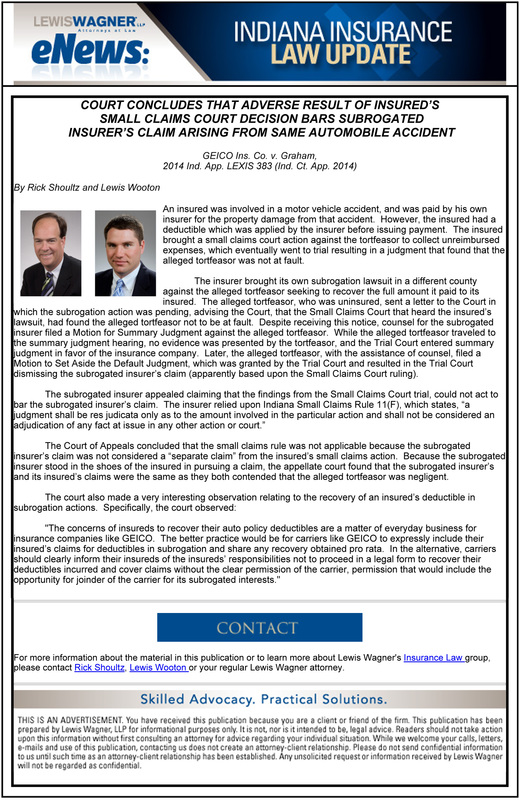 Co.
Estate of Curtis v. GEICO General Ins. Co.
Defender Sec. Co. v. First Mercury Ins. 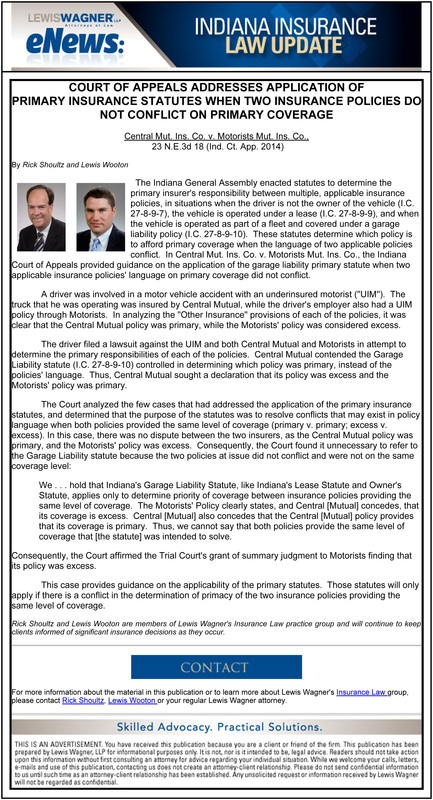 Co.
Missler v. State Farm Ins. Co.
Nautilus Ins. 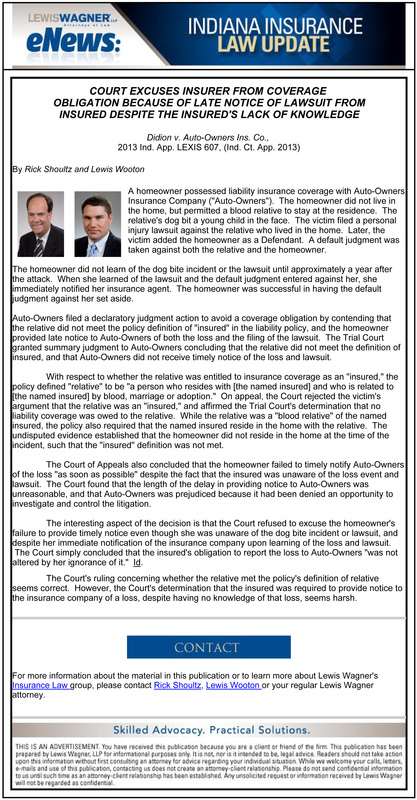 Co. v. Sunset Strip, Inc. et al. 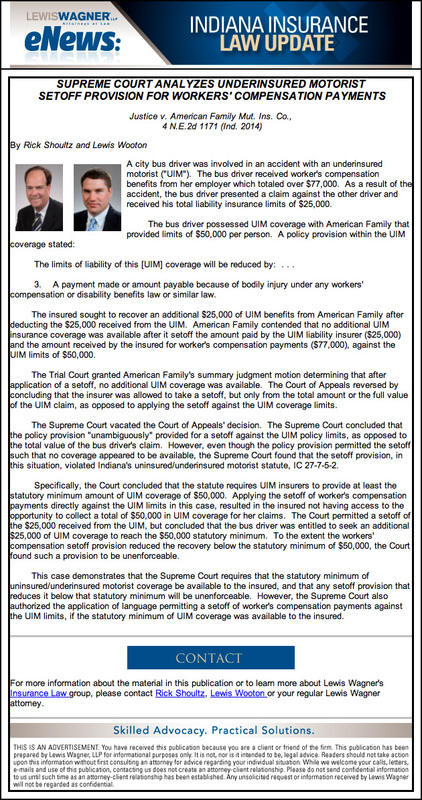 County of Jefferson v. Teton Corp.
Lodholtz v. York Risk Service Group Inc.
Central Mutual Insurance Co. v Motorists Mutual Insurance Co.
Seeber v. General Fire and Cas. 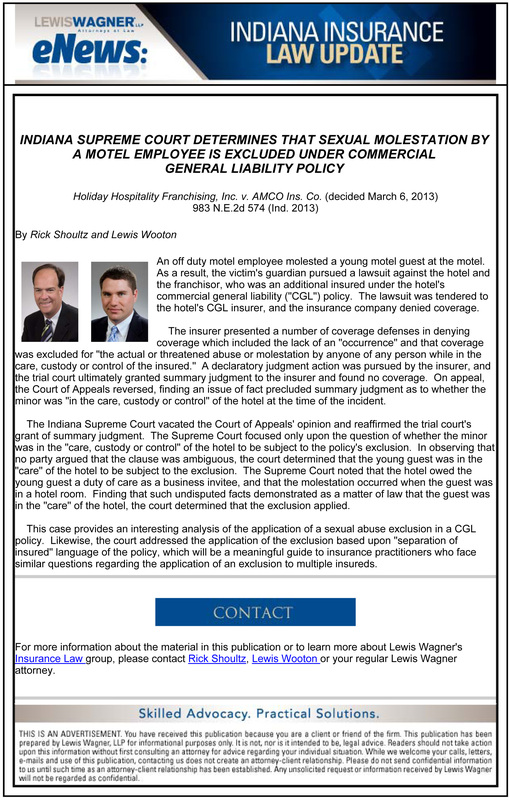 Co.
Didion v Auto Owners Insurance Co.
Deeter v Indiana Farmers Mutual Insurance Co.
Everhart v Founders Insurance Co.
Holiday Hospitality Franchising v AMCO Insurance Co.
Inman v State Farm Mutual Automobile Co. 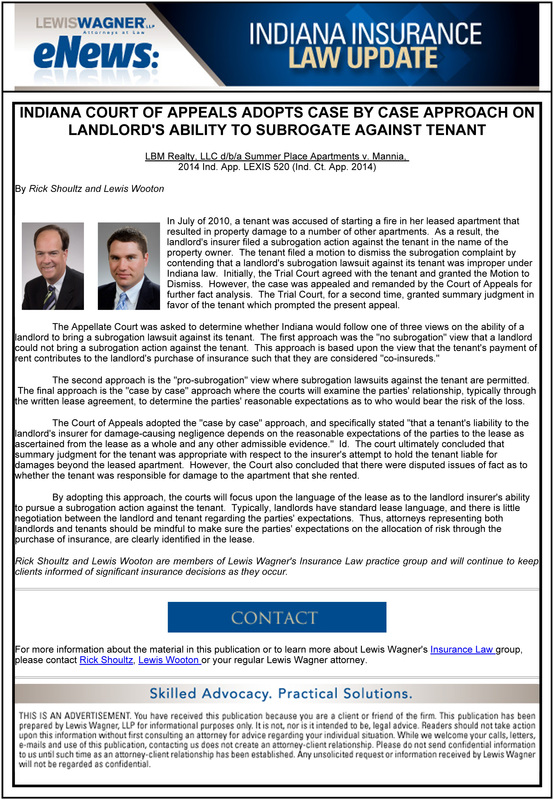 Obtained summary judgment on behalf of private landowner following allegations from a neighboring property owner.